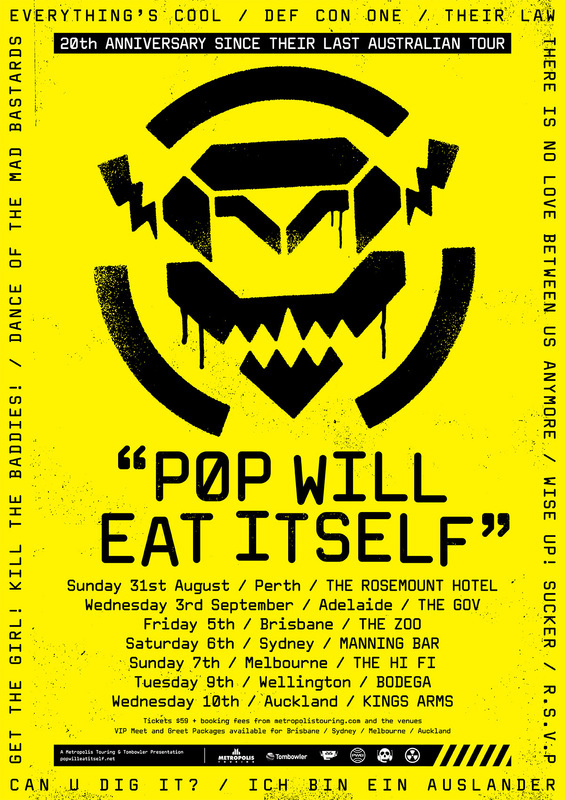 Pop Will Eat Itself, aka PWEI, aka the Poppies stormed on to the late 80’s UK scene with their high energy, industrial tinged dance / rock anthems. They shared many a stage with such musical contemporaries as Ned’s Atomic Dustbin, Jesus Jones, and The Wonder Stuff. However, it was their sample driven, biting social satire that set them apart from the others and they quickly gained a rabid worldwide following. Their relentless live shows and groundbreaking artwork also solidified their position as innovators. During the late 80’s and early 90’s Australia was like a second home for the Poppies playing a stack of incredible shows that are still talked about to this day. Now in August and September 2014, the Poppies will be making their long overdue return to Australia for the first time in two decades! After a years of going full tilt, the band racked up a gobsmackingly awesome musical legacy before running out of steam in 1996 when Clint Mansell called it quits to work on his award winning soundtrack career. All remained quiet on the Poppies front, bar a brief reunion in 2005 until 2011 when original member Graham Crabb, legendary vocalist Mary Byker (Gaye Bykers on Acid, Killing Joke Apollo 440, Pitchshifter), drumming powerhouse Jason Bowld (Pitchshifter, Killing Joke) and Gary Numan’s guitarist Tim Muddiman fused an all new reinvigorated line up of the band we loved so much - Pop Will Eat Itself! The line up will be giving some of the Poppies best known songs a huge workout on this tour including Everything’s Cool, Wise Up Sucker, Def Con One, Ich Bin Ein Auslander, Can U Dig It?, Dance Of The Mad Bastards, PWEIzation, R.S.V.P and many more. If you were there last time, you know what to expect. If you weren’t you’re in for one of the best nights of the year and one that will be talked about for the next two decades!